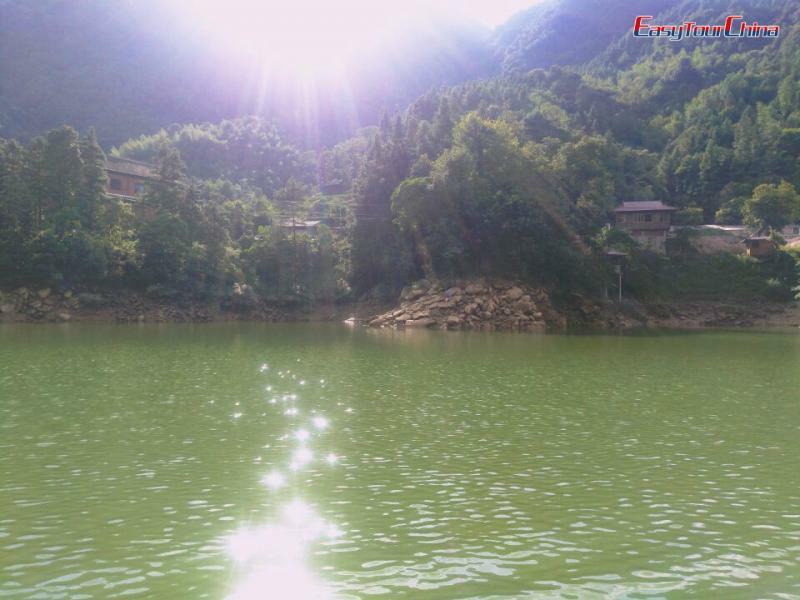 At the end of August, I was honored to have a charming tour to Congjiang County of Guizhou Province with my colleagues. 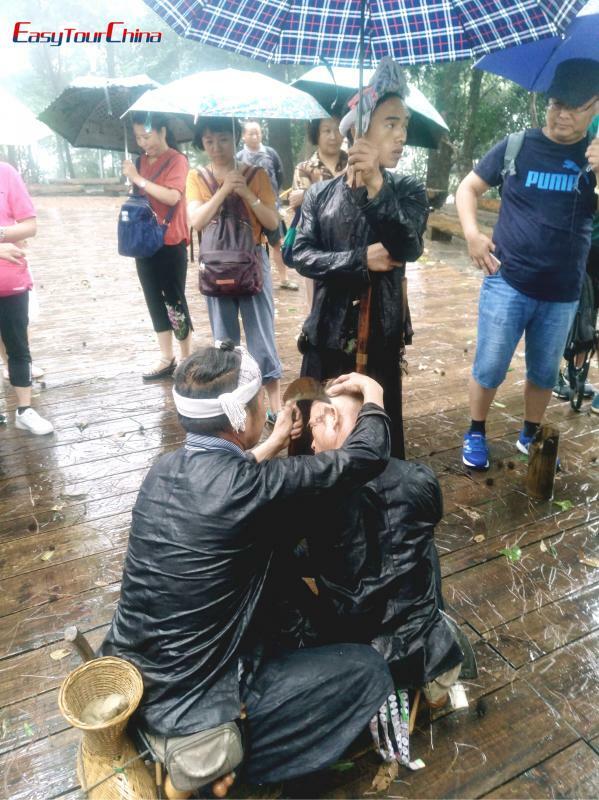 This Guizhou Tour really opened my eyes and let me have a new understanding of what an authentic village tour in China is really about. 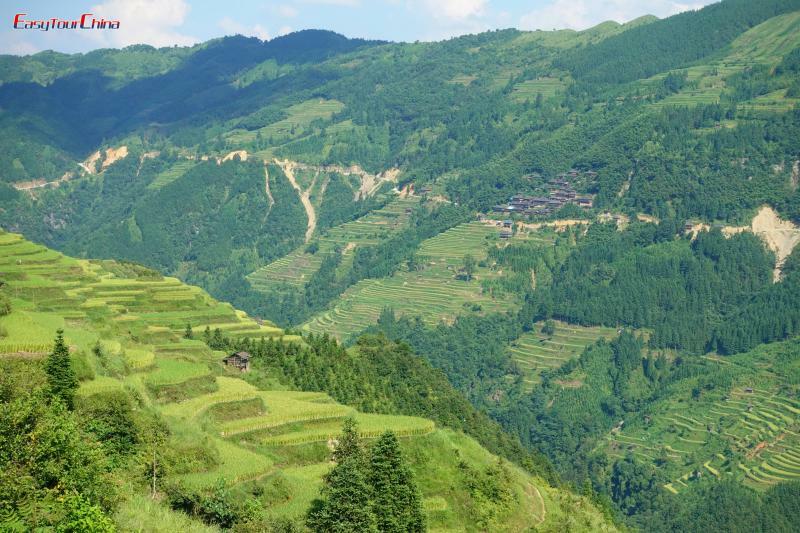 For a feast for the eyes on Guizhou tour, a trip to Jiabang Rice Terraces is necessary. 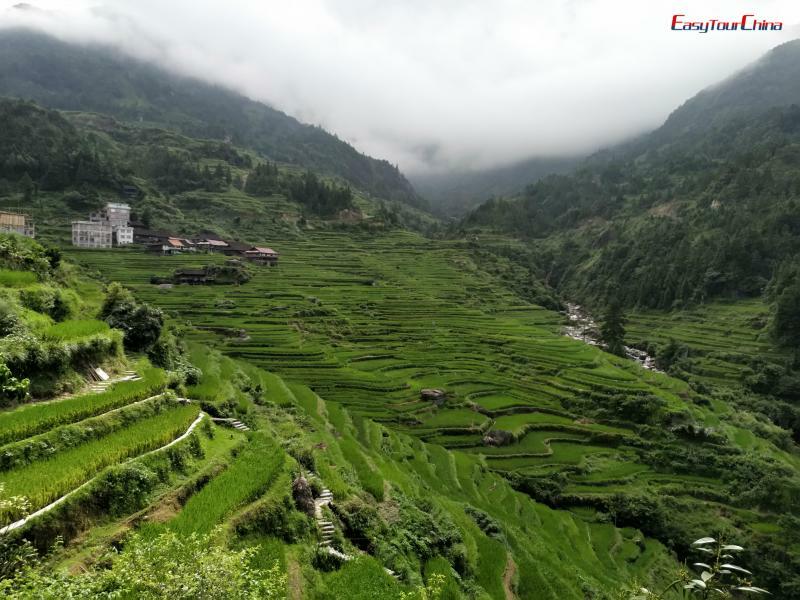 Located 80 km away from Congjiang, Jiabang Rice Terraces are among the most beautiful rice fields of Guizhou and even in China. 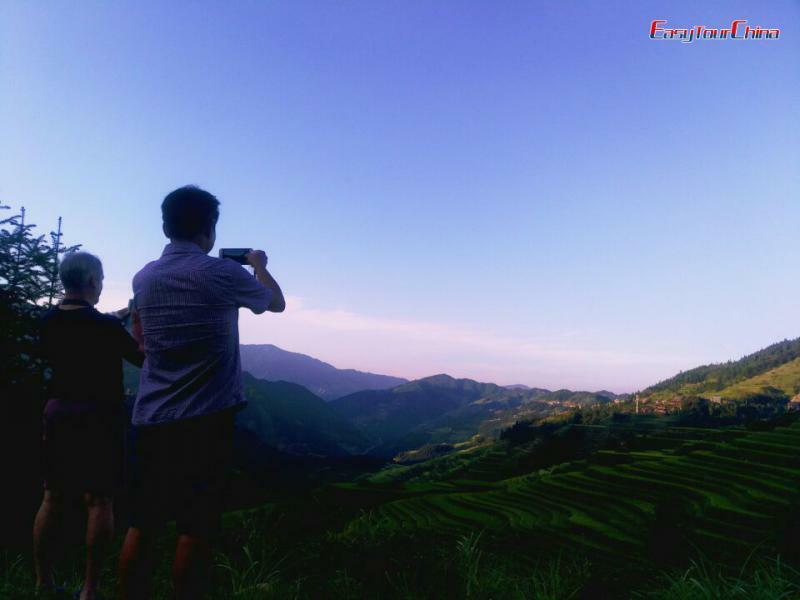 The large size of terraces makes Jiabang so beautiful, and the whole rice fields reflect the amazing views when they are irrigated. The water flowing down to irrigate the fields looks crystal clear. The air is so clean. 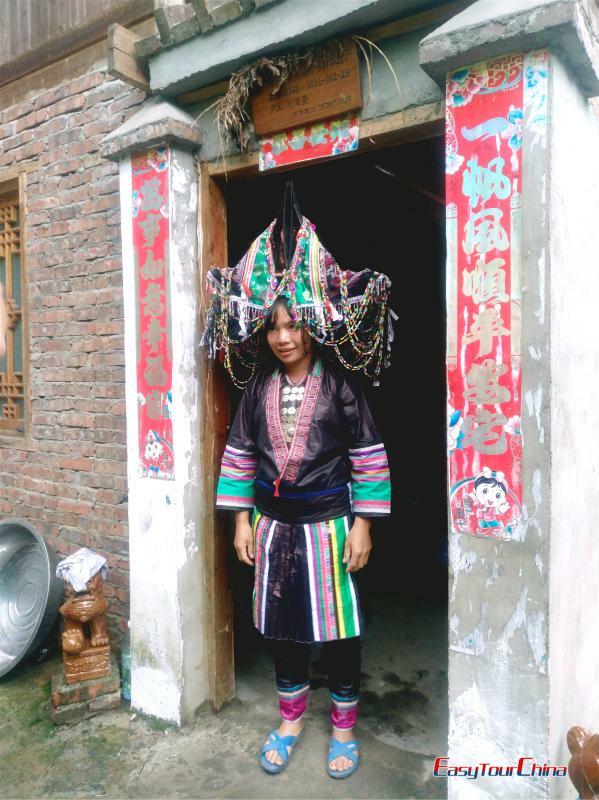 The villages and the waving smoke from their kitchen chimneys, the locals in Yao minority costumes… All of these reflect the harmonious beauty of human and nature. 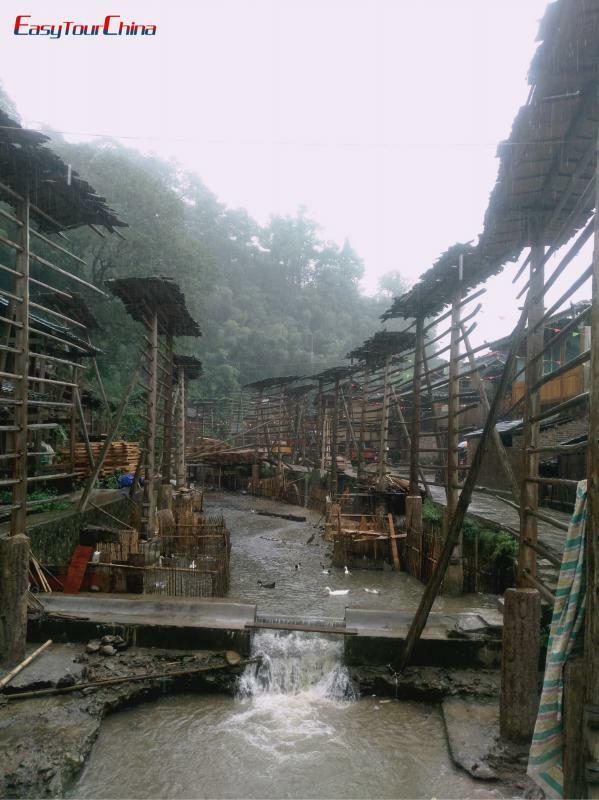 Our first stop was Jiashui Miao Village. It attracted me immediately when I set foot on this land. All of the stockade village houses remain their ancient simplicity. The forests here are also well protected, which you may inadvertently find some precious tree species. Besides, the villagers are so friendly that made us feel like coming home. 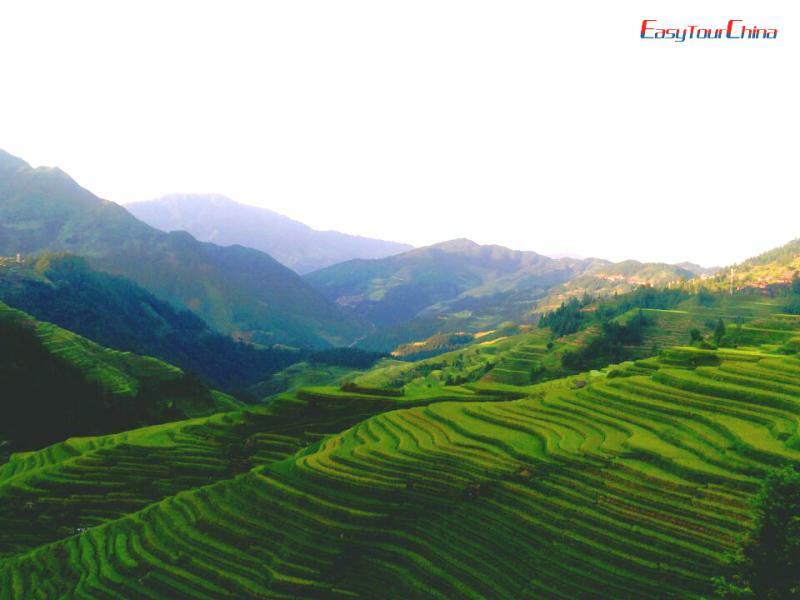 Along the road from Congjiang County to Jiashui Miao Village, spectacular terraced fields can be seen here and there. In late summer and early fall, the terraces gradually change from green to yellow. Against the blue sky, while breeze passing by, the rice on the terraces begin dancing in the wind. Several wooden houses are dotted sporadically over the terraces. What a picturesque old-world village! It is definitely a paradise for photography lovers. About half an hour later, the rain finally stopped, we started to take a leisure walk in Zhanli Dong Village. 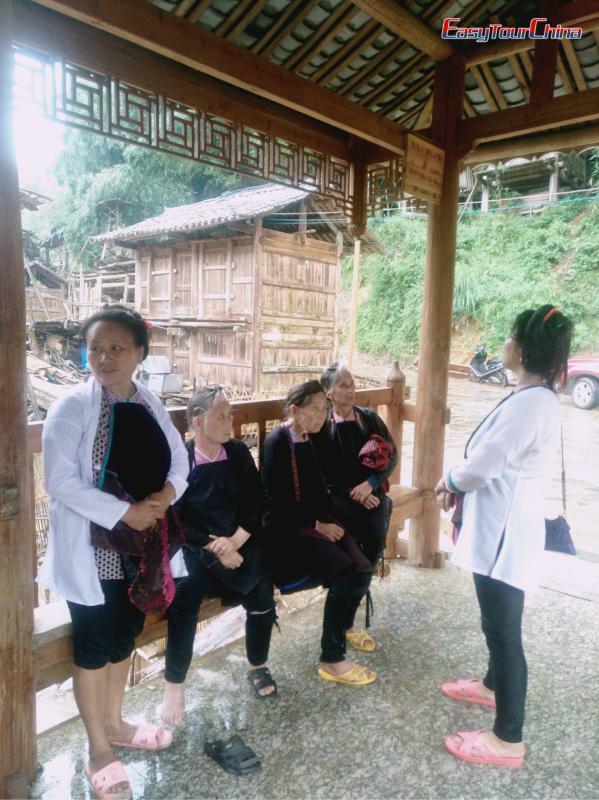 The effective inheritance education of the birth consciousness in ZhanLi Dong Village is a quite typical and successful instance. They have excellent control over reproduction. Every family here has only a son and a daughter. What an amazing village! 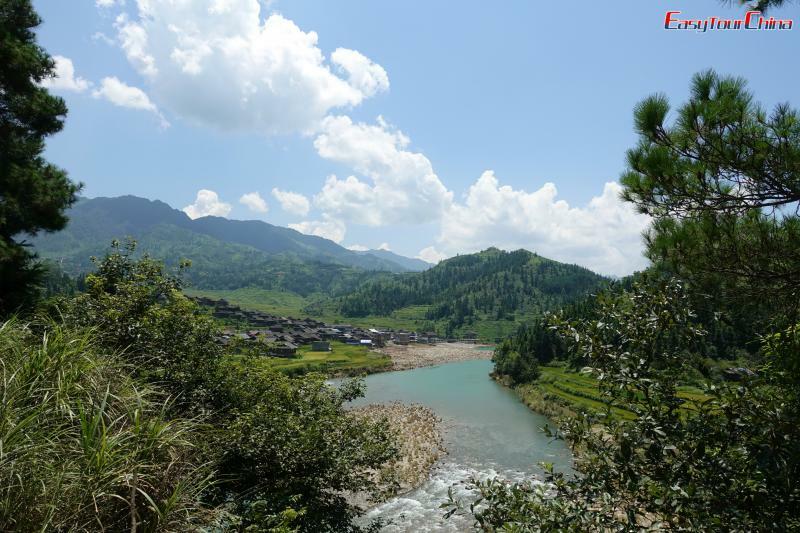 Unlike the former minority villages, Zhanli Dong Village is well planned, and everywhere is clean and neat. Along the road, we happened to meet the locals holding the Kam Grand Choirs in a drum-tower. Kam Grand Choirs is a non-accompany multi-sound chorus folk art. 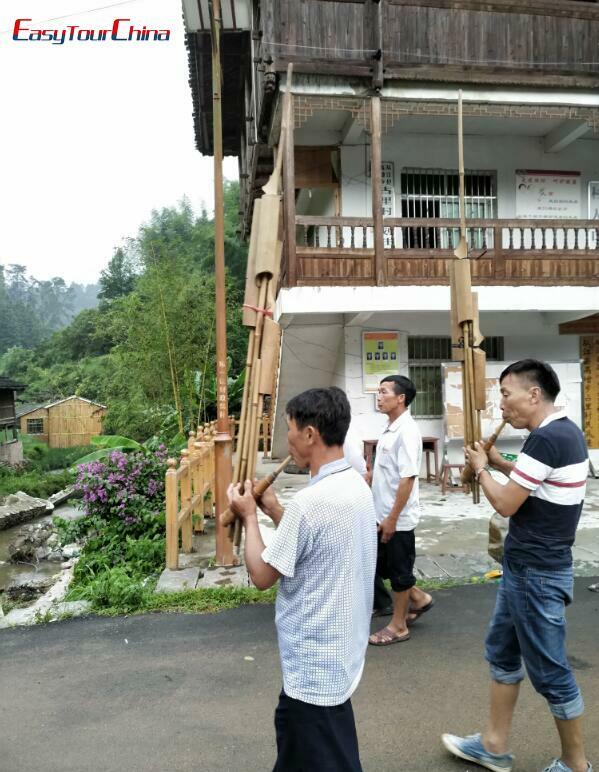 Dong villagers treat song as treasure, knowledge and culture. And they believe that who knows the more songs, and then who is the most knowledgeable person. The Kam Grand Choirs has been well known both at home and abroad since reform and opening-up in China. So it becomes very useful to cultivate the national spirit and develop the soft power of Culture. 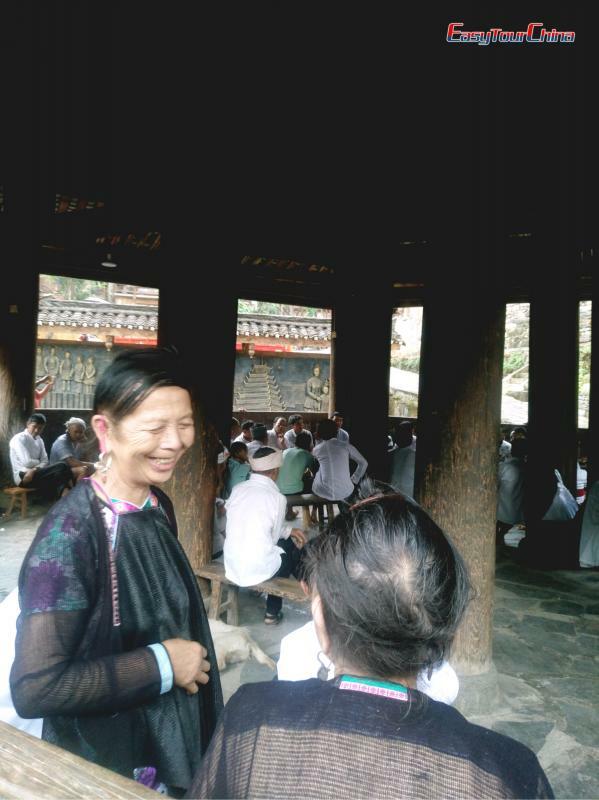 Just as we were about to leave, we met a group of villagers who were performing the Lusheng, which sounded very nice. Ethnic minorities always have so many colorful activities. 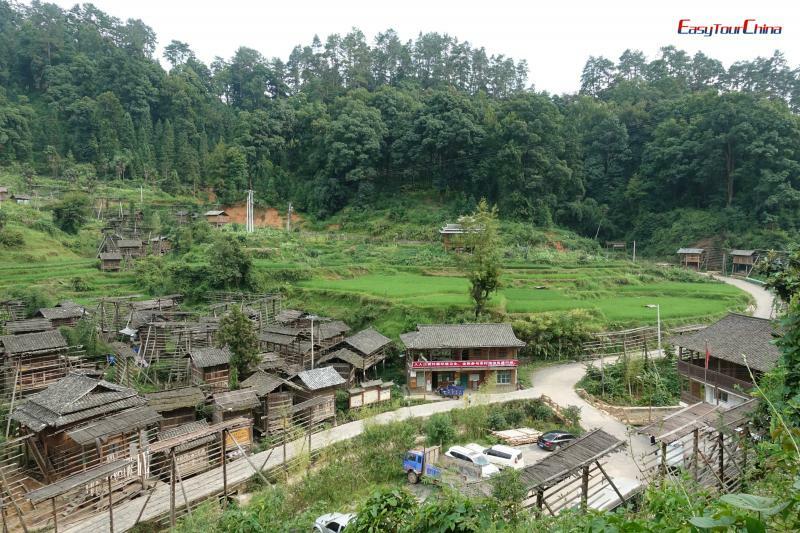 The next morning, we started our journey in Basha Miao Village. 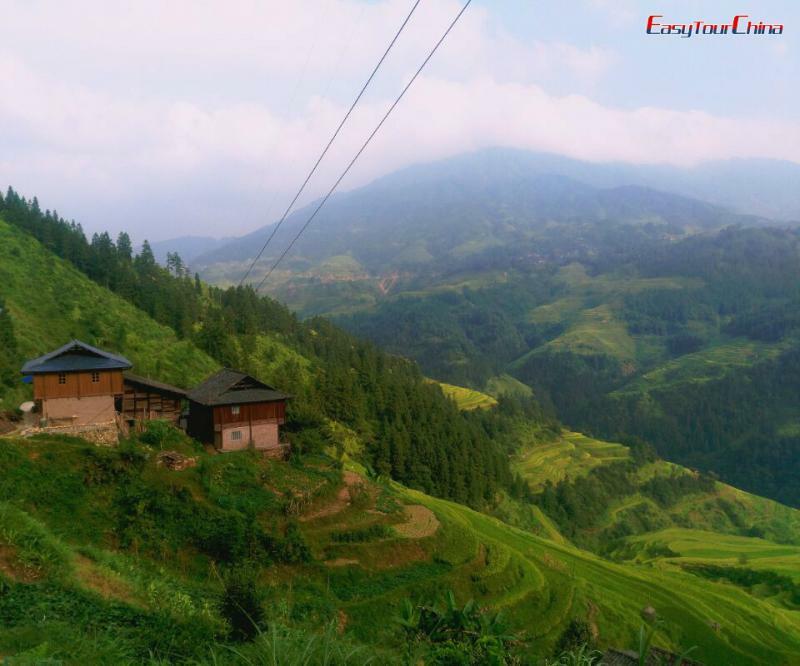 The air is so fresh; the village is lying quietly, like a green leaf in the deep mountains. All here is so peaceful and gentle. But you may be surprised to know that it is the China’s last gunner tribe. Basha people are very brave and versatile. 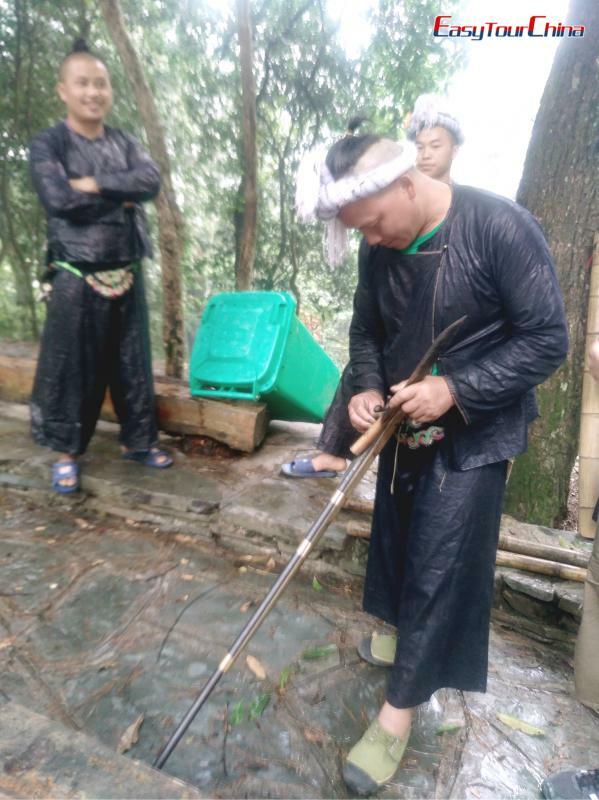 They can be deemed the “living fossil” of traditional culture of Miao since they still remain the production and life style over 2,000 years ago. Their rarely-known culture of tree burial and worship are much unique and mysterious. What’s more, there is one rare convention and skill which you may consider unbelievable – sickle-haircut. If you are interested and have the guts, try it. 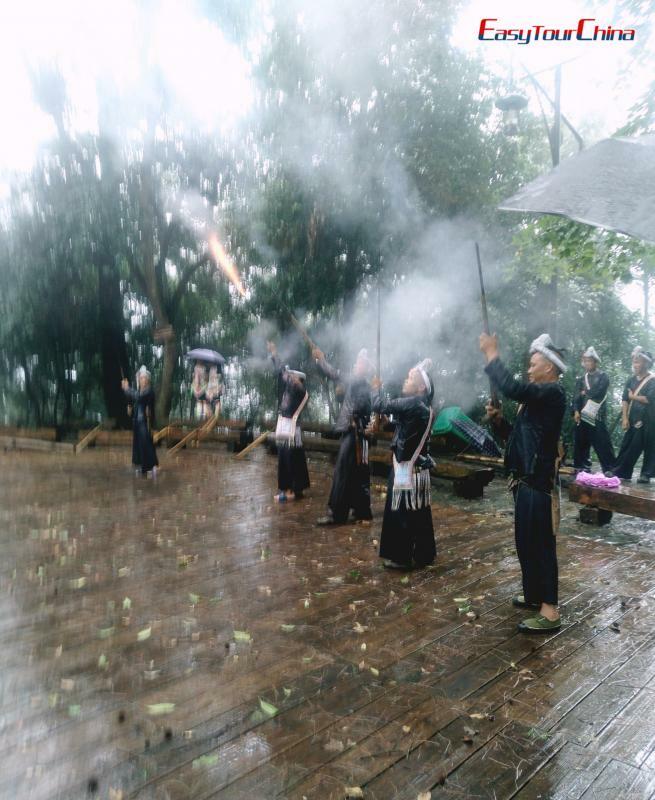 There’re other series of traditional performance events being held every day, such as welcoming guest by firing the gun, Lusheng dance, horse fighting competition and so on. But we were not lucky enough to watch all of them because of the heavy rain. 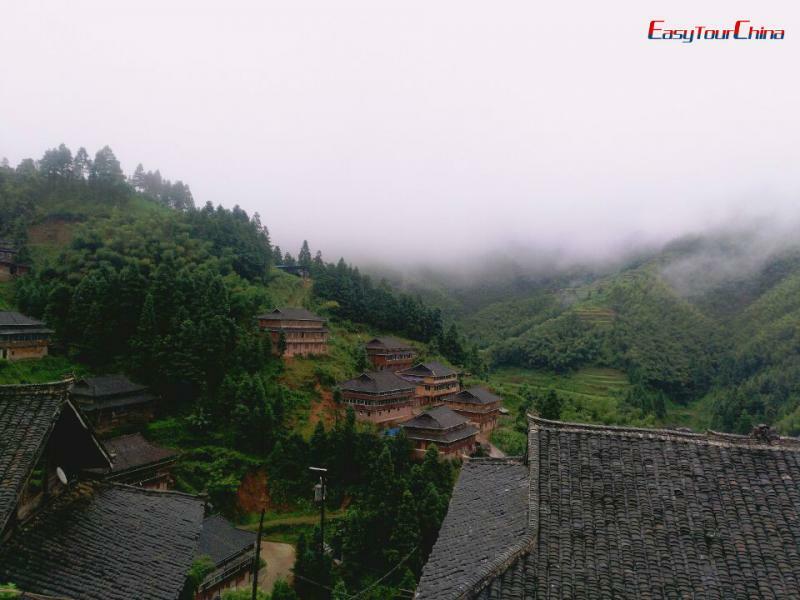 Here comes my favorite village - Gaohua Yao Village, which is built on the top of a high mountain, folded in the mist in every morning, like a fairyland. The fresh air rise from the thick forest and streams is cool and humid. The rice terraces down hills are partly hidden and partly visible in the mist. 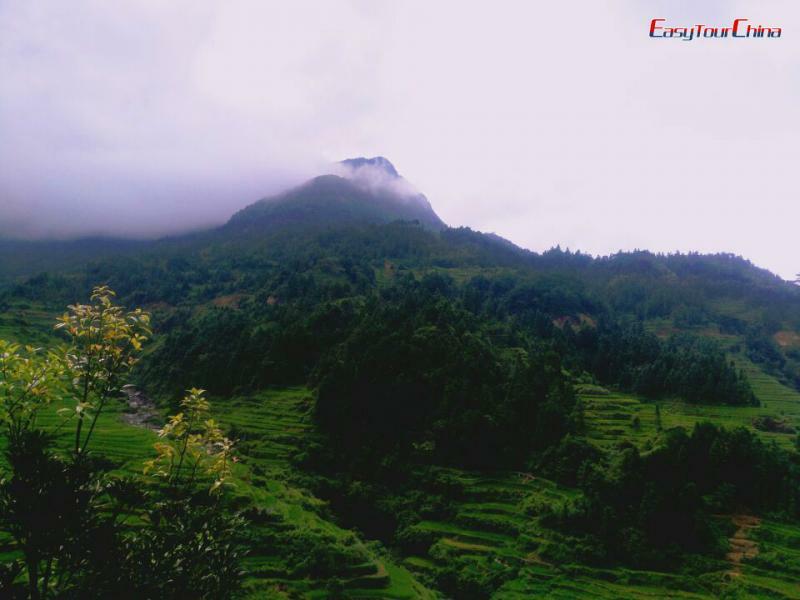 For the time being, I was content to gaze at the distant mountain emerge from the clouds. As I was watching they were glowed pink in the setting sun before turning silver in the moonlight. Towards evening, I saw the smoke rising from original wooden houses’ cook chimneys. What a beautiful view! The best part was taking a medicated bath before went to bed. 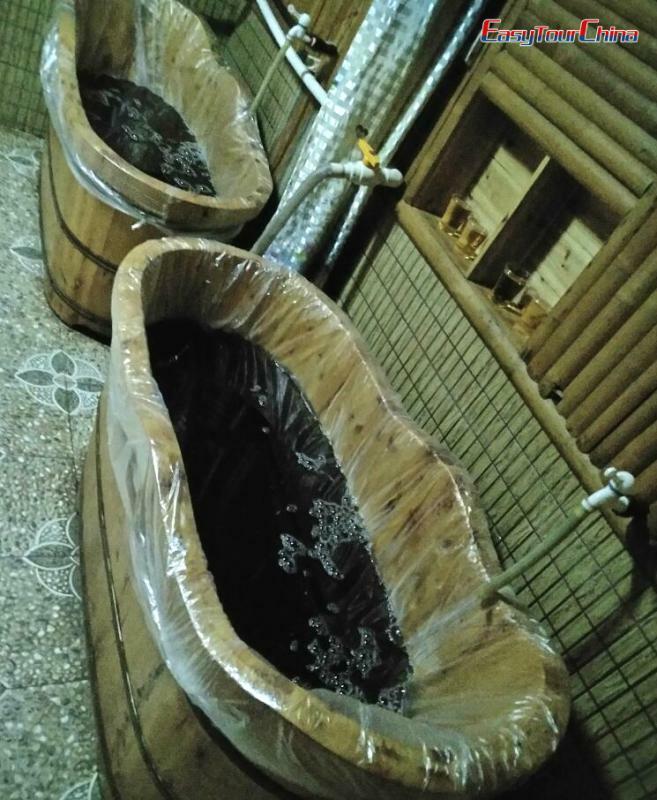 Nothing is more comfortable than a Chinese herbal bath. Just relaxed, and let the spirit of nervous get slow better rest mode, wash away the dust, and banish evil. If you take the medicated bath all year round, you will be very healthy. According to the elder in the village, there still exist many old wooden houses, and some of them even have reached the age of 3 or 4 hundred years old. The elders are not only very good at telling folk stories, but also have fantastic traditional clothing technology includes knitting, dyeing, broidery, tapestry, etc. The landlord of the hostel is very kind and friendly. The day we left, this lovely family made delicious noodles as breakfast for us, and then waving goodbye on the windowsill reluctantly. What a sweet moment! In the middle of that day, we continued driving to our next stop - Dragon Lady Trench Tourism Village. 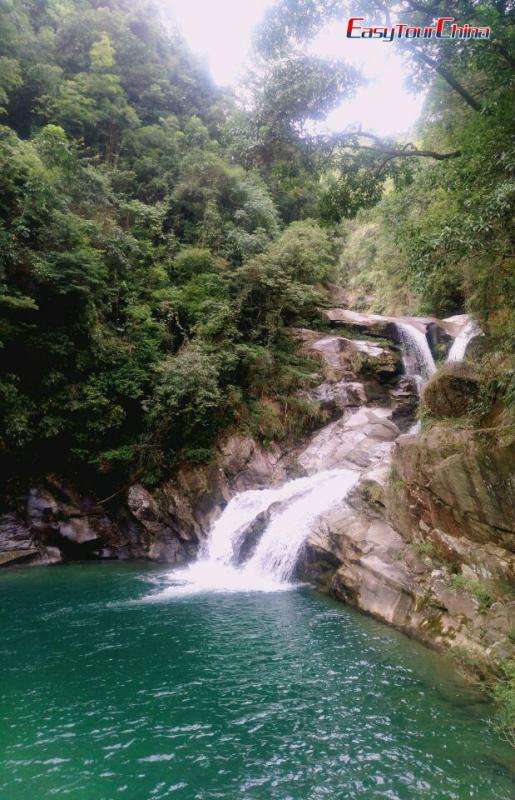 It is a perfect place for hiking. The thick forest, the peace and quiet atmosphere of the county, huge stones, clean and cool lakes and splendid waterfalls... All of these made us linger. 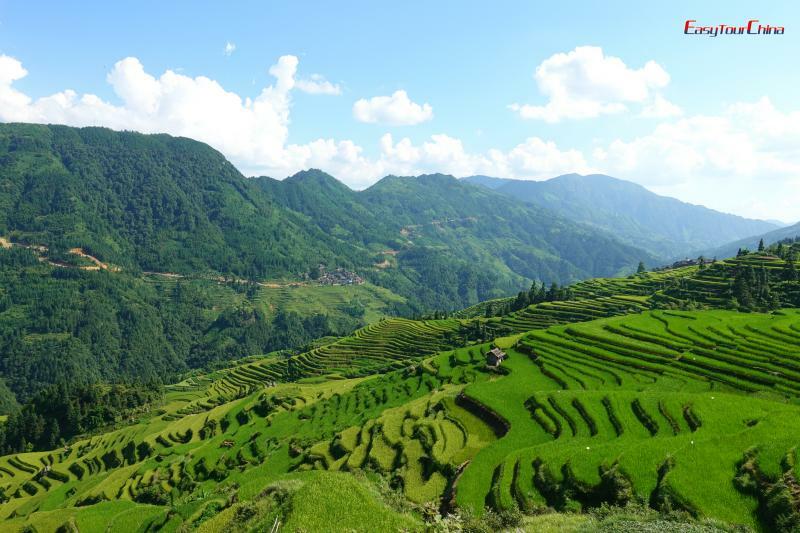 Terraced fields are scattered all over the rolling mountains, which are quiet spectacular. After enjoying the feast of beauty, we winded round the base of the lofty Yuanbao Mountain, and headed to our last destination – Xiaosang Village. Along the road, we found many Lusheng pillars standing in the fields. 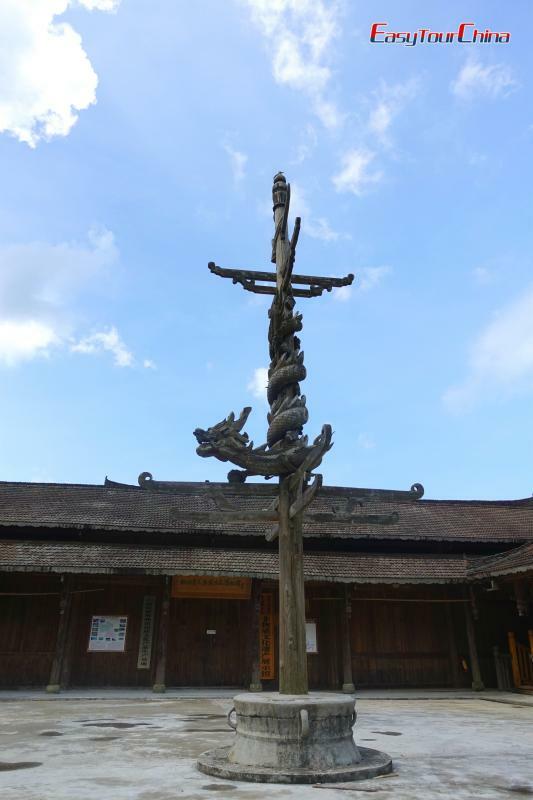 When we arrived at the Xiaosang Village Museum of Ethnography, the gate was closed, but we saw a huge and exquisite Lusheng Pillar with dragon totem standing in front of the closed door. 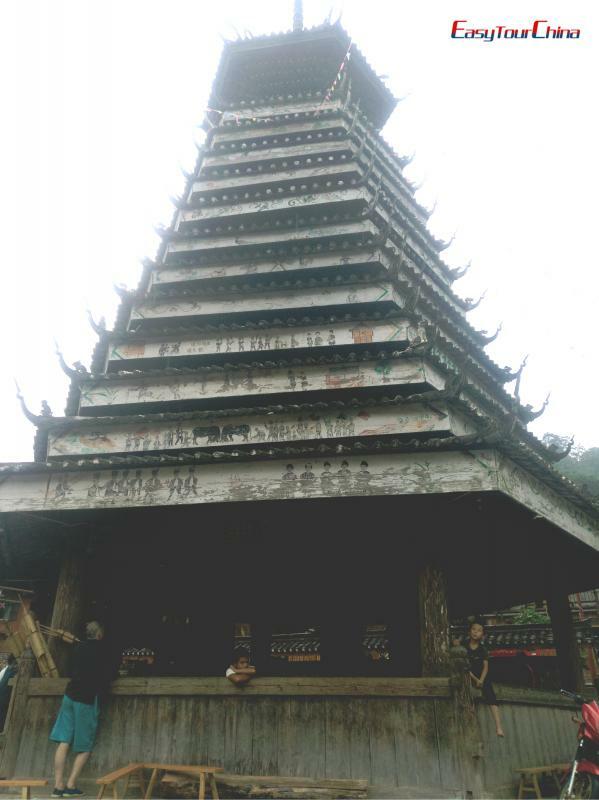 It is carved with animals and fairy tales, reflecting the good vision of the villagers. The terraced fields here are as spectacular as we’ve seen before, but most of the old houses here have been destroyed and replaced by concrete houses, which was a huge pity. So, if you want to get to know the real Chinese minority villages, you’d best hurry up and take the chance to book a China village tour with us, before the original Chinese countryside disappeared!